If there is one thing you can count on in Boston, it's that you can never count on the weather. Even though it is still officially summer, it certainly felt like a fall day today. It was grey and dreary and in that vain, I dressed accordingly. But just because the weather brings me down, doesn't mean my outfit has to. Even an all black and tan outfit can add a bit of whimsy with some polka dots and ruffles! 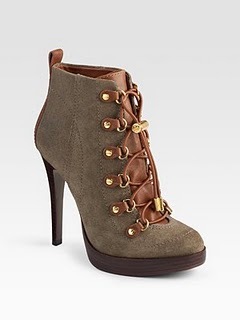 There seems to be several versions of the high heeled hiking bootie as seen here. I must say this look to me is reminiscent of the high heeled sneakers we saw a few years ago. What inspires one to design such shoes and what about this shoe entices buyers to buy it? This is a trend that I just don't get. 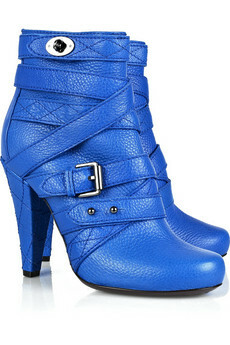 But the electric blue Mulberry booties I spied at netaporter, I would totally rock them. Now the kitten heel is back and this is something I can get into. Don't get me wrong, my wardrobe of stilettos will not sit idle but a kitten heel every now and again is something I'm thrilled to mix in. 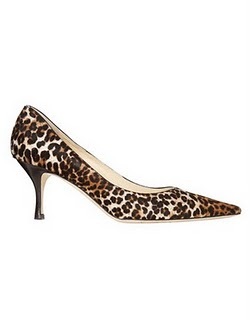 (like the leopard Jimmy Choos seen below). There is almost nothing better this time of year than fresh, local tomatoes in all varieties. I can eat them every day for every meal. Tomato sandwiches, salads, with mozzarella or even plain with just a touch of salt. I buy mine on Tuesdays and Fridays at the Copley Square farmers market and I always buy way too many because who can resist all the gorgeous shapes and colors?! We're starting to get that weird in between weather where it's still summer in the direct sunlight but come early morn, evening or a spot of shade and there's a chill in the air. Welcome to New England. The dilemma is, what to wear?? Here's tonight's answer for a casual dinner in the 'hood. Gabrielle Coco Chanel. Pioneer. Entrepreneur. Style Icon. Women the world over still celebrate you every day. I celebrate you with every pearl I wear, handbag I carry and unconventional fashion choice I make. You are my inspiration.